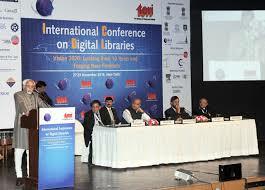 The theme of the International Conference on Digital Libraries (ICDL) 2013, the fourth in ICDL series, was ‘Vision 2020: Looking Back 10 Years and Forging New Frontiers’. The conference provided an international forum for sharing of experiences among researchers, educators, practitioners, and policy makers from a variety of disciplines such as library and information science, information and communication technology, archival and museum studies, knowledge management and various other related areas in the fields of Science, Social Sciences and Humanities. It facilitated the bridging of knowledge gaps between developing and developed countries; initiated capacity building activities in digital libraries; provided a forum for facilitating useful interaction amongst information science and technology professionals; and most important of all, facilitated the formulation of recommendations on digitization technologies, acts and policies in India. Shri M Hamid Ansari, the Vice President of India, inaugurated the Conference at India Habitat Centre in New Delhi on 27th November 2013. The welcome address was given by Dr R P Pachauri, Director General, TERI. Dr M M Pallam Raju, Minister for Human Resource Development, Government of India gave a special address. Mr Prabir Sengupta, Distinguished Fellow, TERI gave an introduction to the ICDL 2013 programme. 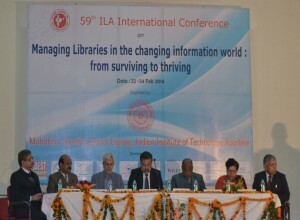 The 59th International Indian Library Association (ILA) Conference was organised by Mahatma Gandhi Central Library, IIT, Roorkee from 22-24 February 2014. More than 300 participants attended the conference where more than 60 papers were presented in 8 technical sessions. Prof Pradipta Banerii, Director IIT Roorkee in his address highlighted the importance of a library by stressing that library defines an institution. 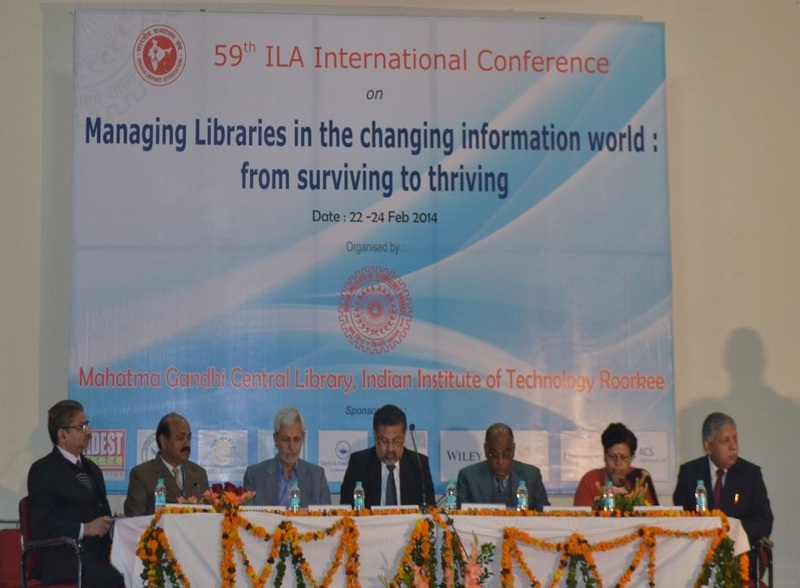 Prof Ashu Shokeen, ILA President highlighted ILA’s contributions and achievements for the library and information science profession in the country since its inception in 1933. She emphasised ILA’s successful proactive role in addressing the national issues of the library professionals on many fronts. The inaugural session Chief Guest, Prof. R. D. Singh, Director, National Institute of Hydrology, Roorkee emphasised the need for libraries to continuously reinvent and reengineer their activities and services to address the changing requirement of the clientele. The inaugural session concluded with the formal vote of thanks proposed by Prof, Praveen Kumar, Chairman Library Advisory Committee, IIT Roorkee. We invite proposals for roundtable discussion topics for a two-hour programme during the next IFLA World Library and Information Congress – WLIC 2014, to be held from 16-22 August 2014 in Lyon, France. The session aims to address the ways that libraries and information services in government agencies are putting in place programs and projects where information and knowledge can be systematized and shared, contributing to solving particular public issues. We are glad to inform that a new translation of the Guidelines for Libraries of Government Departments is already online. Thanks to the collaboration of CHEN Ning, from the National Library of China, the Chinese version of the Guidelines can be found in our publications webpage. The guidelines are meant for managers and line staff of government libraries. It takes the shape of a working guide, where examples, models of behaviours, services and best practices are listed and can be followed when they suit the situation. We are especially happy this time because with this new translation, every IFLA official language has been covered. We are proud to have shared the Guidelines with a growing community of librarians around the globe. A new IFLA World Library and Information Congress will be held in Singapore next month. We are glad to inform that we will be leading there a session focused on Open Government. It is open to all IFLA participants who wish to discuss the theme, its set of features and how could be applied on current information procedures in the government sector and as part of citizen services. The format will be flexible and interactive. Selected panelists will introduce topics by way of a 5-10 minute presentation. They will then chair round table sessions with participants from the audience, discussing the impact of these topics on their library services, how to effectively put the plan introduced in the presentation in place, and more. The outcome of each discussion group will be given by the original speaker or a Section member as a session wrap-up. More details on the session’s programme are available at the official IFLA conference site. EIFL, through the Public Library Innovation Programme (EIFL-PLIP), is offering an Innovation Award for Contributing to Open Government. The criteria of selection include only to public or community libraries located in a transition or developing country. Ideally, the libraries which enter the competition are working in alliance with government agencies in offering e-government services or facilitating participatory democracy at local level. The IFLA World Library and Information Congress will be held in Singapore this year. As in past events, the Government Libraries Section will be sponsoring some activities during the Congress. One of them is the session “Information for Development Action: Governments, Civil Society and Libraries“, which is mainly organised by the Government Information and Official Publications Section.